No likes stay at one place for a long time and we all love a little bit of outing to someplace else. Those people who have Niagara Falls in mind then it’s time that to give it a shot. 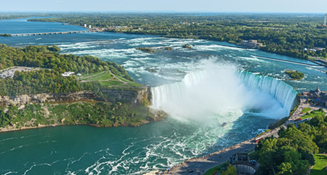 In reality, the Niagara region offers not only the wonderful falls to the travelers from various parts of the world but also there are many other things to mesmerize the visitor’s eyes. The famous region is known not only for its great falls but also for its excellent wineries, historic towns, and wonderful architecture pieces. Well, you can enjoy this tour on your own and check the different attractions in the Niagara region. At the same time, you can also take NIAGARA BUS TOUR and thereby get to experience a fantastic trip filled with adventure, fun, and thrill. In that case, check below to find the various attractions in the Niagara region before you start packing your bags.Why should you visit the Niagara region? This fall is referred to as Horseshoe Falls that measures about 2600 feet wide and spurts water of 600,000 per second. On the other hand, it is also known as Bridal Veil on the American side. Also, it is a big contributor to the Great Lakes that holds nearly 20 percent of the world’s fresh water. Well, this is gigantic and that is why people from all over the world comes to this place to see this amazing wonder of the world. DO KNOW ABOUT THE NIAGARA ON THE LAKE? Another famous tourist attraction of NIAGARA SIGHTSEEING TOUR is the great Niagara on the Lake. This famous historic town fills the heart of any traveler who comes to this place for the first time. Here, a visitor can grab a bite from any eateries and take a tranquil walk through the towns of this place. Another characteristic of the great Niagara region is the winery of this place. The soil of this place is considered to be good for grapes and hence, it is a place where some of the best wines in the world are made. Well, here a tourist can try the wine samples while touring the region. HAVE YOU HEARD ABOUT THE SMALLEST CHAPEL IN THE WORLD? Everybody who comes here for the first time never misses the smallest chapel in the world that lies on the shores of the Niagara River. This chapel is so small that it is even recorded in the Guinness book of world records. Tourists usually click some photos and even go inside to have a better look of it. There are also many other attractions in the Niagara region and that is why it is always advised to the people who loves travelling to come here once and see the great wonder of the world by their own eyes.